No Problems, Blue Chair Bay Coconut Rum, Triple Sec, strawberry purée, Sprite and lime in a mason jar garnished with a pineapple leaf and an orange wedge, around $7.69, depending on location. Preheat oven to 450 degrees. Place bacon in a large, deep skillet. Cook over medium high heat until evenly brown. Drain, crumble and set aside. Clean oysters and place in a large stockpot. Pour in enough water to cover oysters; bring the water and oysters to a boil. Remove from heat and drain and cool oysters. When cooled break the top shell off of each oyster. Using a food processor, chop the bacon, spinach, bread crumbs, green onions, and parsley. Add the salt, hot sauce, olive oil and anise-flavored liqueur and process until finely chopped but not pureed, about 10 seconds. 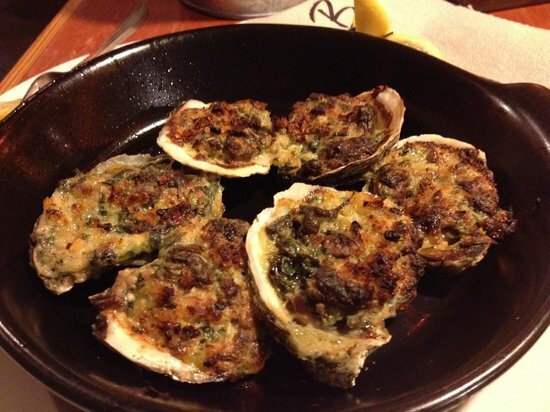 Arrange the oysters in their half shells on a pan with kosher salt. Spoon some of the spinach mixture on each oyster. Bake 10 minutes until cooked through, then change the oven's setting to broil and broil until browned on top. Serve hot. To make the Miso Marinade: Boil the sake and mirin for 20 Seconds to burn off the alcohol. Turn down the heat and add the miso paste. Stir with spatula on high heat until the paste is completely dissolved. Add the sugar and turn up heat and stir until sugar is dissolved. Remove from the heat and cool. 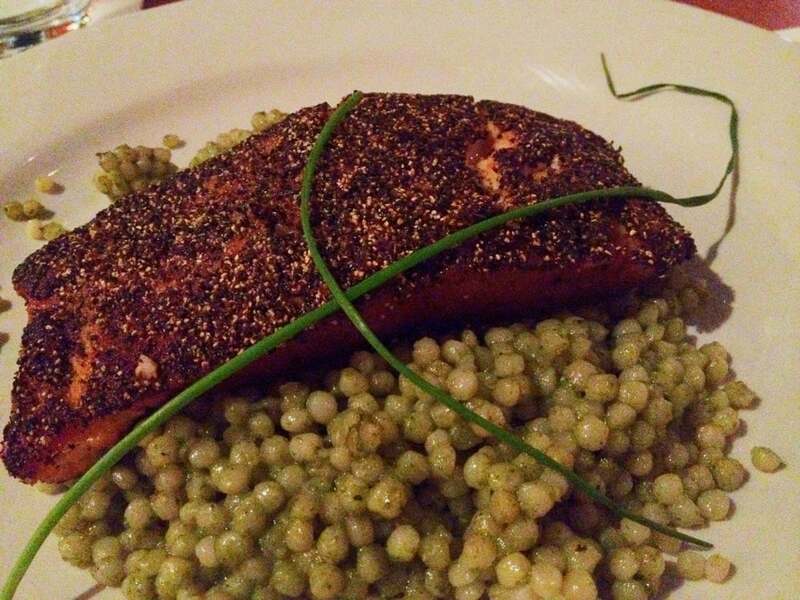 To make the Glazed Black Cod: Place the fish in a baking dish with 1/2 cup of water. Broil until light brown which takes about 3 minutes. Spoon 1/2 cup of Miso Marinade over each piece of fish. (For more intense flavor, Slather 3 ounces of marinade over each portion and allow to marinate for up to 3 hours.) Finish in a 450 degree oven for about 6 minutes or until cooked through. Garnish with half lemons and serve. This recipe makes 8 restaurant servings. Place the salmon in a shallow dish just large enough to hold the fillets. Add the lemon juice, garlic and salt and turn the fillets to coat both sides. Let stand for 5 minutes. Spread the pepper on a plate and lightly press each fillet into the pepper to coat both sides. Heat a nonstick pan over medium heat and, when hot, spray with vegetable spray. Cook the salmon until done, about 4 to 5 minutes on each side. Garnish with lemon slices. Serves 4. Put water, onion, celery, peppercorns, bay leaf, and salt into large saucepan. Heat to boil. Add shrimp; cover and return to boil. Drain immediately. Peel shrimp and put into large bowl. Add half of the melted butter and sherry. Toss to mix. Heat oven to 400 degrees. Mix remaining melted butter and breadcrumbs in small bowl. Stir in parsley, shallot, garlic, paprika, and cayenne. Spoon half of the shrimp mixture into a buttered 1 1/2 quart baking dish. Top with half of the breadcrumbs. Top with remaining shrimp mixture. Top with remaining breadcrumbs. Bake until crumbs are lightly browned, about 10 minutes. Serves 4. 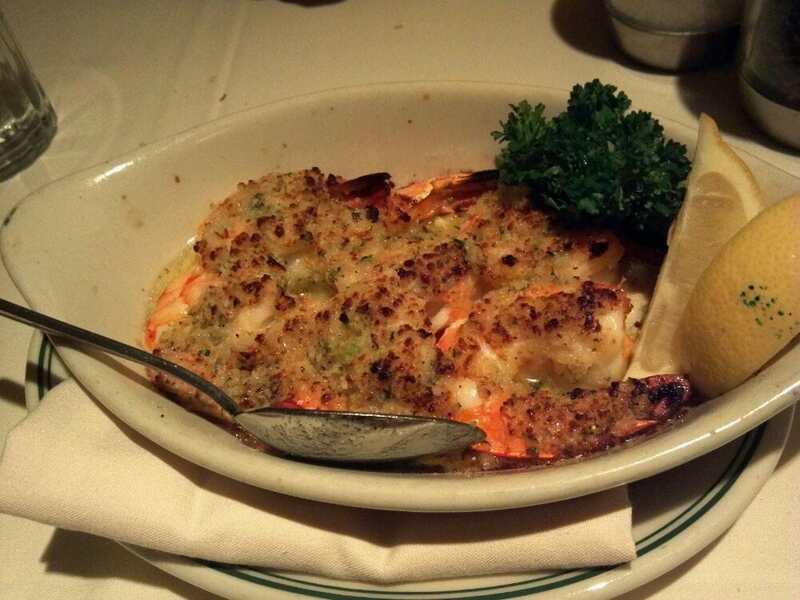 Garnished with a snow crab leg and a rim of housemade Joe’s Spice blend. 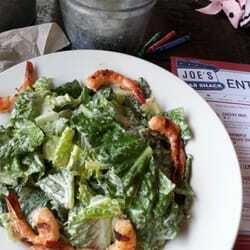 Joe's offers grilled chicken or shrimp. To make this at home pick up a basic caesar salad kit and plop whatever seafood you have on a George Forman Grill seasoned with you favorite grill spices. Couldn't be easier. 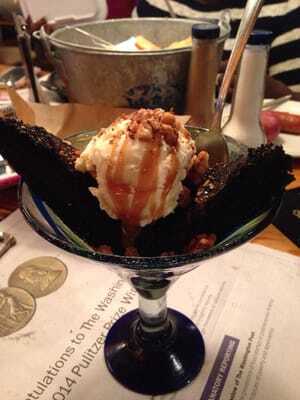 Gooey chocolate cake a la mode topped with caramel and candied nuts. 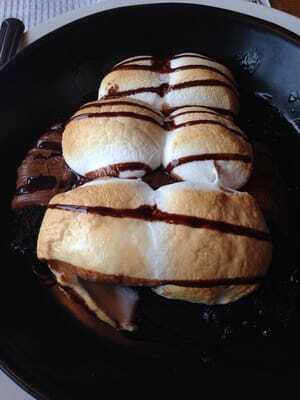 topped with a Hershey’s Chocolate bar and freshly toasted marshmallows.